This Room Sign Ships Out Directly from This Huge Warehouse! Place Your Order by 1pm EST (M-F). This Room Sign Will Ship Out Immediately! 3.75" x 15" 5.75" x 6" 5.75" x 9" 8.5" x 11"
Designed to accommodate 8" x 3-3/4" portrait or landscape style graphics. Front loading with a suction cup included to lift-up the front lens. 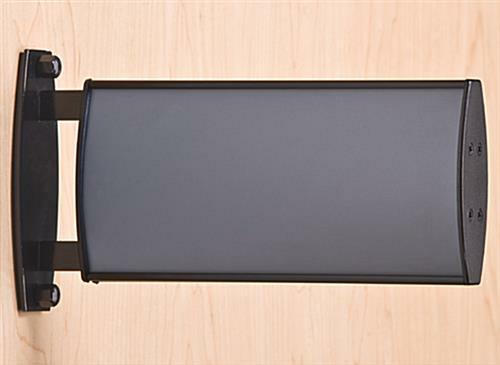 Made from aluminum with black finish complement easily to any indoor environment. 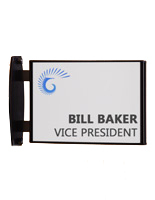 Screws included to mount the double-sided signage at a perpendicular angle to any wall. This wall signage, room sign is two-sided designed to maximize the graphic exposure. Users can use both sides to display the same or different graphics. Each side is designed to fit two 8" x 3-3/4" artworks. 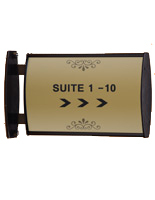 This room sign that has a rectangular design is ideal for showing directions, communicating department names or displaying important notices. Customers can print their artwork by using a regular printer to save on cost and time. This wall signage is durably made from aluminum to last long. This room sign that has a brushed black finish with a classic design makes the unit blend in easily to any indoor environment. A non-glare lens is included with each unit to protect the graphic from getting ruined. This wall wayfinding system is sure to draw customer's attention. This flag signage, room sign that features a front loading design permits fast and easy graphic changes. One of the best features of this wayfinding system is that users do not need to remove the entire unit from the wall in order to change the artwork. 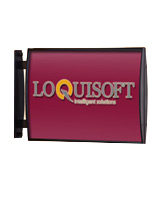 Your printed graphic can be changed from the front by using the suction cup provided to lift-up the non-glare lens. Each of these curved room sign comes with a back steel backer. Users are required to mount the plate to the wall first. Then screw the entire unit into the backer with the decorative nut caps provided. 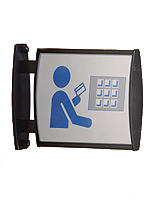 This indoor room sign, also known as directory display system, is perfect for used in public areas. 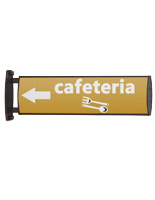 The wayfinding system is widely used in companies to identify specific areas. Sometimes this directory display can also be found in hospitals and universities to show important signs. 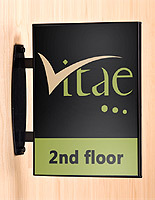 Flag signs like the one seen here can also be used in hotels and lobbies as a wayfinding display to direct visitors. No matter how and where this directory display is used, it is surely a great tool to help your visitors to find their way. 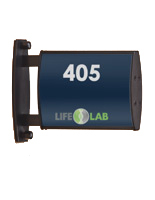 This wayfinding system is sold at a low price. Order these flag signs in bulk for more savings! 9.5" x 5.1" x 1.6"